Last night I got away for a little ‘me time’ at Sait Culinary Campus downtown. I registered for their ‘Knife Skills’ class some time ago and had eagerly been awaiting the day. While I love to cook I am pretty sure some of my basic skills are sub par. 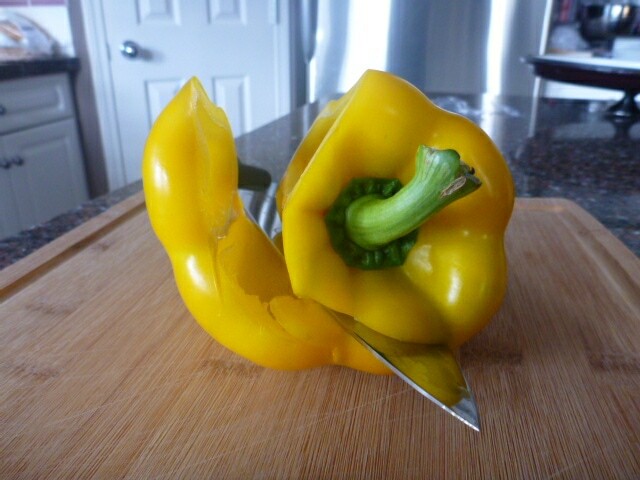 Knife skills is definitely one of them. I found the class and instructor Michael Dekker (former executive chef of Rouge) to be very entertaining and informative. Everyone was there to learn at their own speed and practice as much as they wanted. We started out learning the correct way to grip the knife and practicing slicing motions with our other hand in ‘the claw’ position. When we felt comfortable with these motions we graduated onto dicing celery. Trimming the ends, cutting the stalk in half and then sectioning the two halves into batons. We then chopped the batons into a fine dice. Pretty easy. 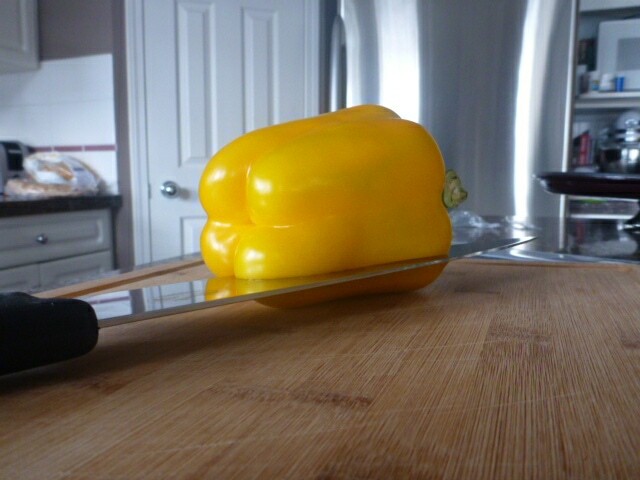 Enter the peppers. 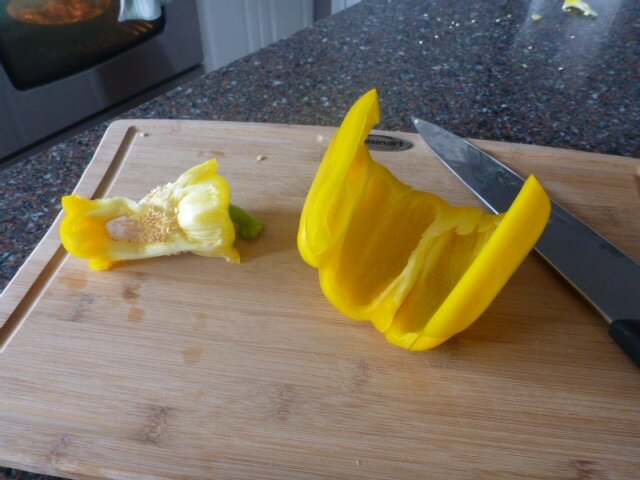 I usually just cut peppers in half, gouge out the stem and seeds, then slice. Our instructor taught us a really cool way of de-seeding and coring the pepper by cutting through one side then rolling the pepper while you continue cutting. 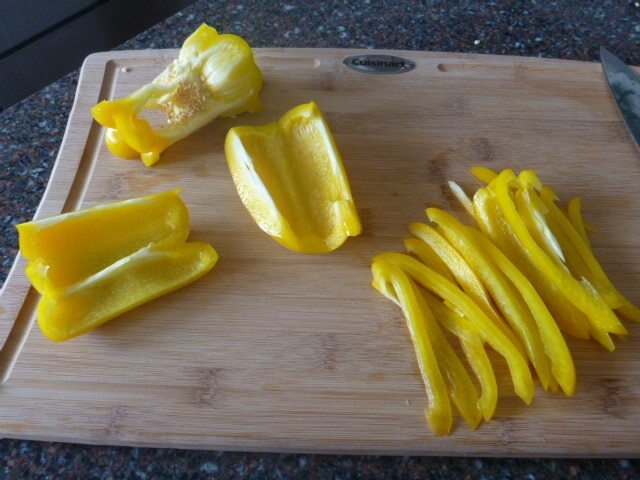 It’s hard to explain but in the end you get just the good part of the pepper if you do it correctly. It’s a neat little trick. 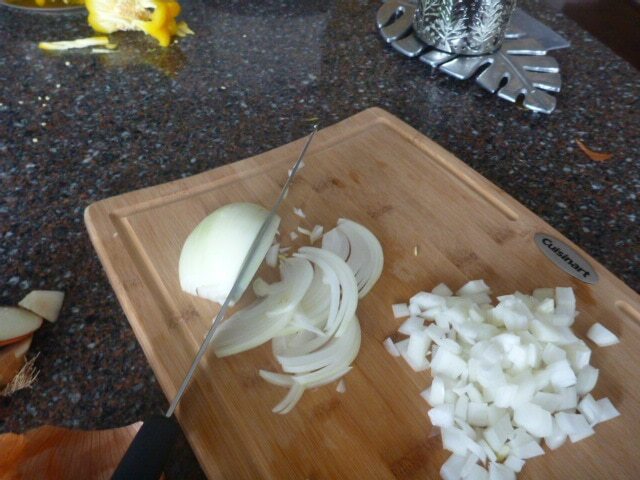 Next, we moved onto onions. 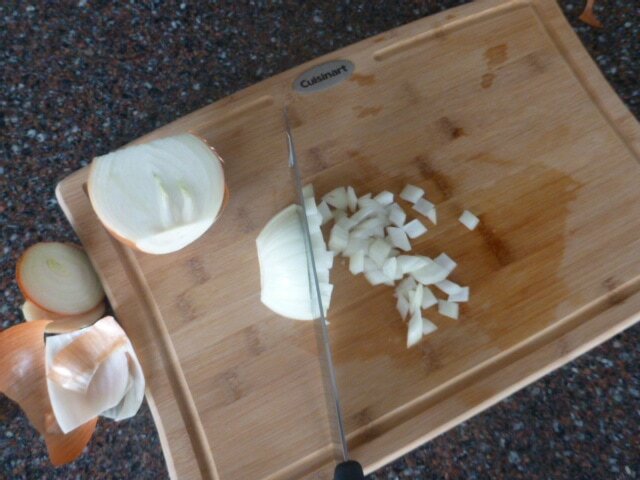 I have my own way of slicing onions and now that I’ve tried the cheffy way, it feels so awkward to me. But I guess that is the point. Eventually it should be as easy as kicking a dog out of the kitchen…hmmm. 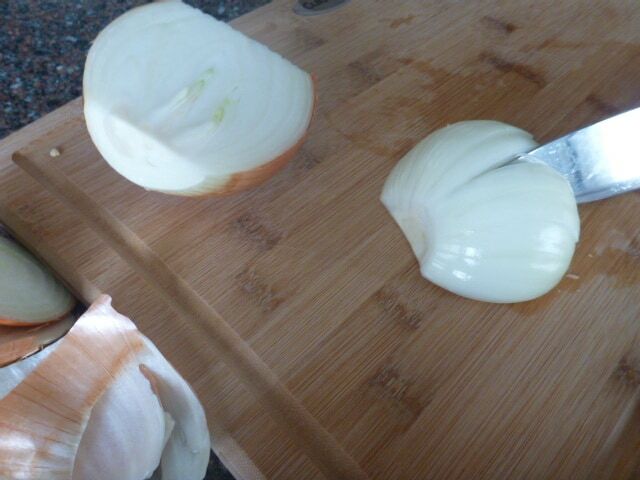 First, we were to slice the onion in half from root end to top end. To dice, you point the root end away and slice the onion according to how large a dice you would like, taking care not to slice through the root end. 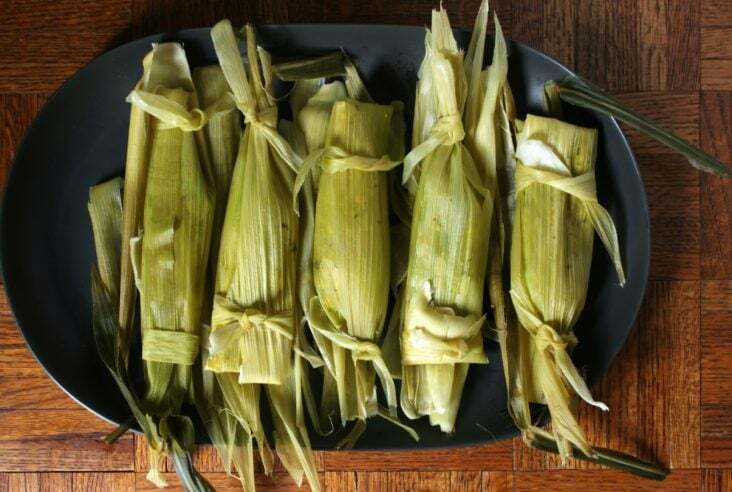 You should have a ‘fan’ of onion slices after this stage. 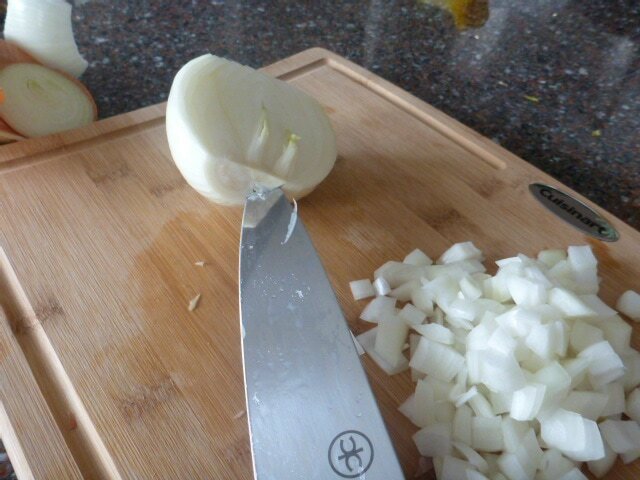 Then you turn the onion 90 degrees to and cut to complete the dice. Easy as pie. Except for me, the onion always fans out so I must be doing something wrong. 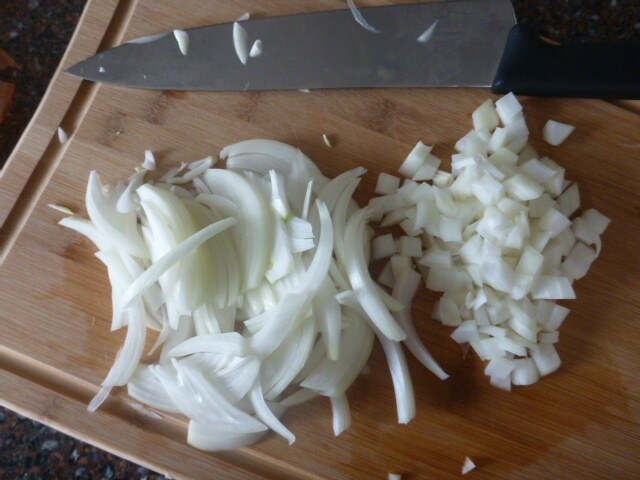 To slice an onion you remove the root end and start slicing from the bottom edge up with a thickness depending on what your recipe calls for. Next we did some carrot dicing which was very similar to the celery except that we had to trim it first so that the pieces were uniform. After all those vegetables, it was time to get into more meatier things. The instructor quickly showed us how to break down a chicken. It may be a surprise to you but this was actually my first time. I am now super embarrassed because breaking down a chicken is supremely easy. I don’t have a picture tutorial for the chicken. The next time I buy a chicken I’ll break it down and take photos to show the method. We were encouraged to take the chicken pieces home and I was able to snag a couple of extra pieces from other students so that I could use it for dinner the next day. I sure felt odd taking the train home, knives in my purse and raw chicken in a bag beside me. The next day, in between the Honours Ceremony at school, packing for Scout camp and a Hockey Skills School meeting, I searched online for a recipe using chicken pieces. The first recipe I hit was Oven Baked Oregano Chicken and Potatoes from Shahdan’s Kitchen. 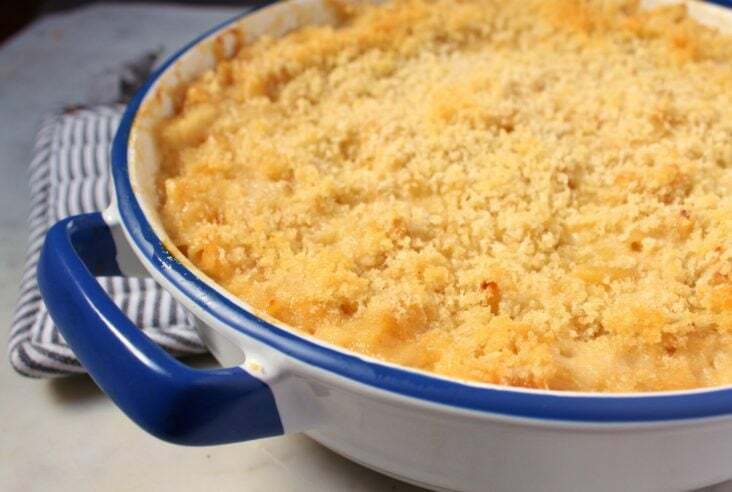 I had all the ingredients and once everything was thrown into a pot I could forget about it until it was time to eat. A busy day kind of recipe! For once I followed the recipe exactly and it came out wonderfully. I think this chicken goes onto the ‘make again’ list. Hey thanks! I had so much fun at the class and I may have even learned something. Of course I’m going to need a lot of practice!